Engineers are requiring the ability to zoom-in on DC power rails to look for AC transients, noise and ripple while they debug their avionics hardware. The space industry is increasingly using faster, higher-density FPGAs and broadband ADCs/DACs powered using lower and lower supply voltages generated by switching DC-DCs and POL regulators. Poor PCB layout, inadequate floor-planning, ineffective de-coupling, and weak filtering cause AC noise, interference and transients on the power rails supplying these sensitive components. Imagine the following scenario; your latest hardware has been delivered ready for commissioning and you have successfully powered up your shiny new board, started functional tests and are seeing rail droop, ground bounce, power-supply-induced clock and data jitter, as well as in-band spurs in the ADC/DAC output spectrum. Why is all of this happening? How can you identify the root causes and how bad are they? How sensitive are the loads to AC noise and ripple on their power rails and what is their PSRR? How quiet must the supply voltages have to be to deliver the required performance? 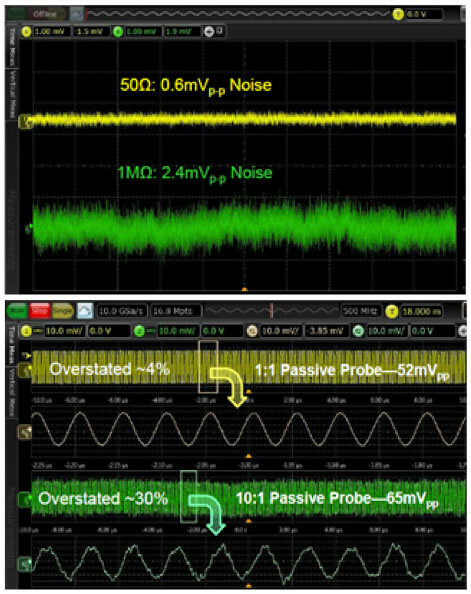 Measuring small levels of AC noise on DC power rails using an oscilloscope can be problematic: first, the instrument and probe add further noise leading to confusion between measurement or power-supply-induced noise. The amount of offset may be limited preventing you zooming-in to view and analyse AC interference riding on top of the DC supply. 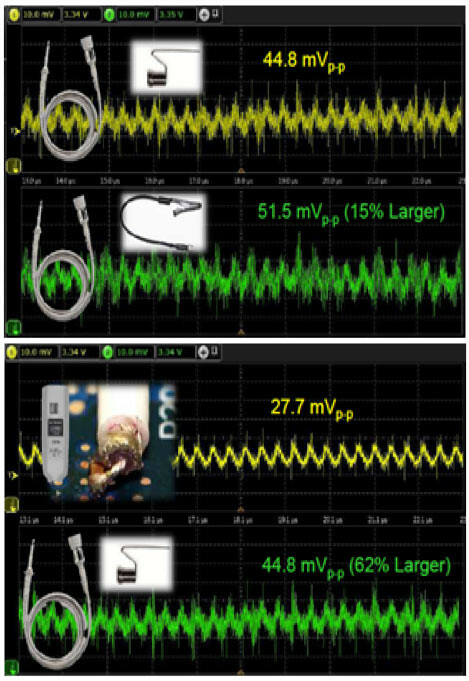 Furthermore, the input impedance of the oscilloscope may load the power rail and its bandwidth may be limited, masking high-frequency switching transients. Given the increasing use of faster, higher-density FPGAs and broadband ADCs/DACs powered using lower supply voltages generated by switching regulators, together with bad design practices, engineers are requiring the ability to zoom-in on DC power rails to look for AC transients, noise and ripple while they commission and debug their avionics hardware. An oscilloscope often does not have enough offset to be able to position a DC power rail in the centre of the screen for the required measurements. Placing a blocking capacitor in the signal path eliminates the offset problem but also masks important information, such as compression or low-frequency drift. The latest, low-noise probes have good noise figure so they do not pollute the measurement of AC interference and ripple on a DC supply. An initial test is to short the inputs to verify that the probe and oscilloscope are suitable for the required measurement task. The plot below summarises the measurement of low-level AC noise on a DC rail and shows the reduction in baseline noise by using a power-integrity probe compared to a standard one. Figure 1: Null measurement to characterise baseline noise. Figure 2: Difference in noise measurements due to attenuation ratio and termination. Dynamic loading of a DC supply by an FPGA or an ADC/DAC occurs at the clock frequency and can generate high-speed transients and noise on the power rails. Designers need high-bandwidth tools to evaluate and understand broadband interference on supply voltages. Switching noise can generate transient frequencies that can easily exceed 1GHz. The length of the ground connection to the probe will impact the measurement of noise as shown below. The probe's internal capacitance and the ground lead form an LC circuit and a shorter return has less inductance. Ground can also act as an antenna for noise. To successfully debug the latest avionics hardware, power-rail probes such as Keysight's N7020A offer a 1:1 attenuation ratio adding only 10% to the baseline oscilloscope noise, ±24V of offset to allow you to centre the signal on the screen and zoom-in to analyse AC noise, 50kΩ loading at DC, and 2GHz of bandwidth to capture fast transients. My FPGA, mixed-signal and power courses discuss how to design your space-electronics hardware right-first-time. Until next month, happy probing and don't let the high-impedance 1MΩ input of your oscilloscope act as an unwanted antenna.